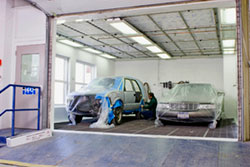 At Vogel's Collision, we have the tools and know-how to get your vehicle looking and running like new again after a collision. Whether your car needs a paint job, dents removed, or a new windshield; we will get the job done in a fair amount of time so you can get back to the important things in your life. No matter if you're a fleet management company or an individual looking for an auto body repair shop, you can count on us to get you back on the road. Contact us today for more information!